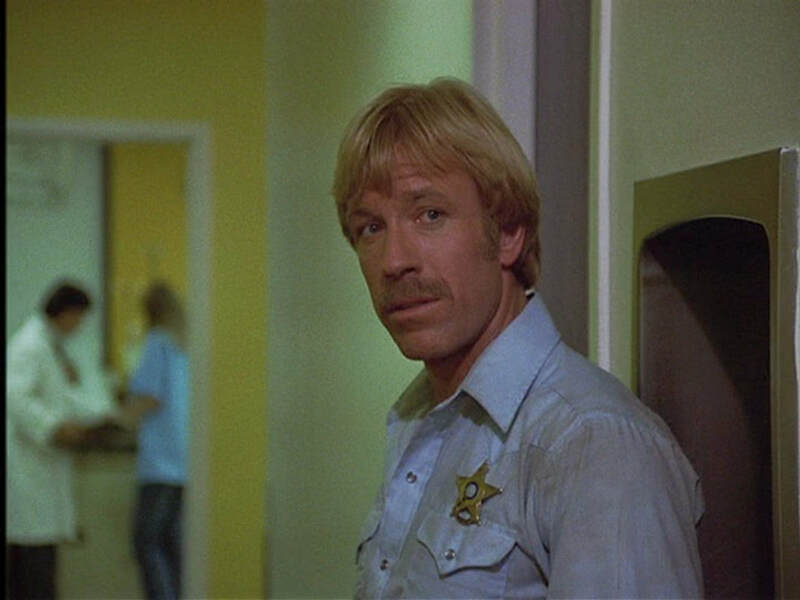 Columbia pictures backed this Chuck Norris flick that takes parts of various genres and balls them up together and believe it or not, makes it work. That’s mainly due to the fact that the horror film elements are tactfully delivered with some first rate direction from Michael Miller. So with a dash of Frankenstein, a pinch of comedy tossed with a smidgeon of romance, an overdose of round house kicks and a spoonful of Michael Myers and Jason Voorhees, we’re treated to a Chuck Norris flick that I can’t figure out why it has taken me years to finally sit down and enjoy. The film opens with Brian Libby tipping over the edge of a mental breakdown and taking an axe to two people. 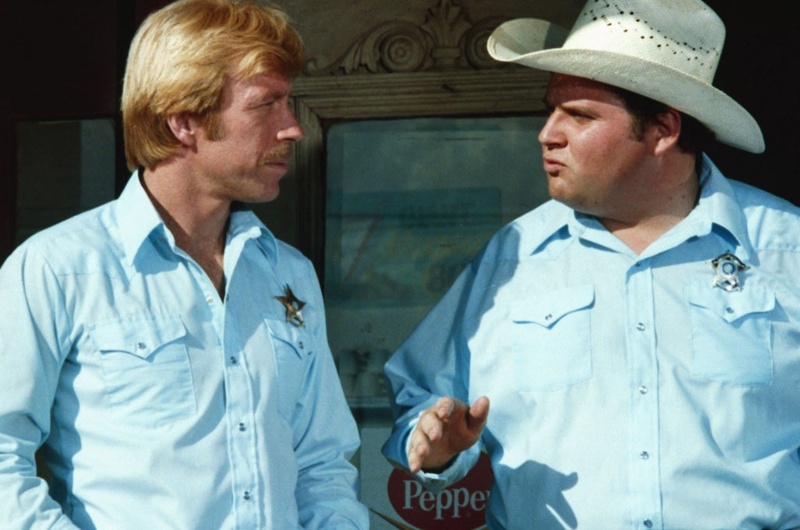 Sheriff Norris arrives on scene with his Barney Fife sidekick and graduate of Animal House, Stephen Furst. As Norris enters the crime scene looking for the killer, Miller displays a sure hand at eliciting some thrills and scares with the camera that will only get better as the film progresses. Libby is eventually shot by Chuck’s crew of officers at which point Ron Silver arrives at the scene. The killer was under his psychiatric care at the “clinic.” It seems that the medical center Silver works at is a genetic research facility run by Steven Keats with assistance from Silver and William Finley. 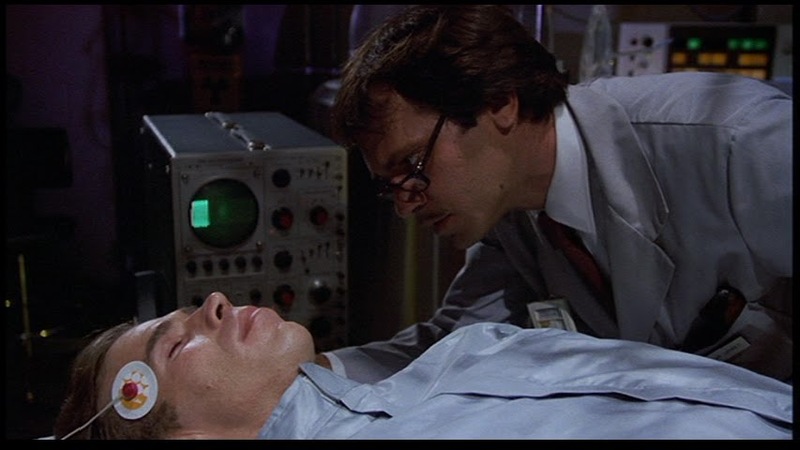 Keats spearheads an experimental serum that is meant to speed up the bodies recuperation to the point where cuts and broken bones mend overnight. Libby is on life support and the perfect guinea pig. Against Silver’s wishes, Keats becomes a 1980’s Colin Clive creating his own monster and “it’s alive!” I did mention a smidgeon of romance was to be found and it’s in the form of Toni Kalem playing Silver’s sister and an ex flame of Chuck’s looking to rekindle that old feeling. To the sounds of the song “It’s time for love” Chuck and Toni engage in what can only be described as an early music video. The pair make love, share a swing, frolic and play till the needle runs through the record. Back to business and some of those round house kicks. Chuck runs afoul of a motor cycle gang in a more serious version of Philo Beddoe vs. the Black Widow Spiders. Same results in the end though the results of Chuck’s beatings are perhaps a bit more life changing for his victims than those delivered by Clint’s Philo. It’s around the half way point that the film takes a decided turn towards an outright thriller when Silver and his wife meet the revived Libby. Aside from the Norris clips that his fans will point to, it’s easily the best five minutes in the movie and could easily stand up to most any footage meant to scare in the Halloween and Friday the 13th sequels. It’s at this point that Chuck is now up against a revived killing machine who in true horror film fashion seems unstoppable. Not the typical by the numbers effort, I was caught by surprise on a couple of occasions as to who would make the final reel and who wouldn’t so on that note, it’s not as predictable as we might assume going into another Chuck Norris karate effort. Special mention as well to a truck stunt near the end of the film that reminded me of what we just don’t see all that often in movies anymore. A real jaw dropping crash with a stuntman behind the wheel. Keep your eye on the credits and you’ll spot Chuck’s brother, Aaron, in the list of stunt men and as a producer. Aaron would go on to direct some of his brother’s action fests including The Hitman and Delta Force 2. Chuck was hitting his stride about this time having come off The Octagon, An Eye For an Eye and Good Guys Wear Black. 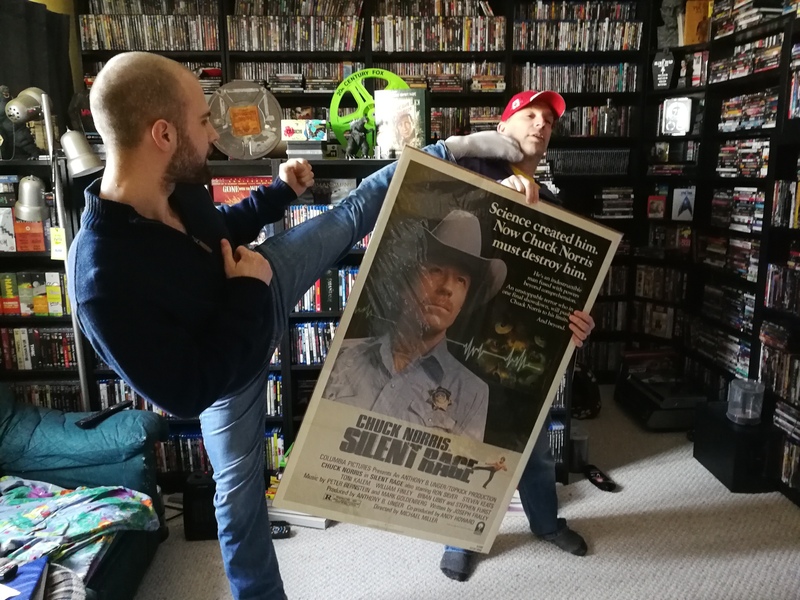 Lone Wolf McQuade was on the horizon and then his teaming with Cannon Films that delivered a number of actioners ripe for the weekend rental on VHS. Especially to those of us who may have been under 18 years of age and unable to get past the ticket booth at the local theater. Far better than I ever expected, I’d easily recommend this one to those looking for a flashback to the 1980’s kickass era of Chuck Norris. When I went looking around the vault here to find my original one sheet, I ran right into a left kick to the jaw as number one son Ethan and his second degree black belt wanted to show me how Chuck delivered his patented move. Taught him everything he knows ……. well almost everything. Boy did that hurt. I couldn’t believe I hadn’t seen it either. Was much better than I expected. Nice retro feel to a time past. I’m still rubbing my jaw over that kick. “Hey Dad, let me scratch that itch for you.” POW! I’m still trying to get caught up on my ’80s Norris flicks…I’ve only seen ‘The Octagon’ and ‘Good Guys Wear Black’. This sounds like it should be next on my list. I had to move pretty quick to avoid a full on foot in the mouth! He’s getting bigger and too quick for the old man. He keeps that up and he won’t inherit the treasures here in the vault! Your now on the list….